The great garden cover story. What is mulch / mulching? Why do smart gardeners mulch? Where should I apply mulch? How should I apply mulch? Cheap & easy mulching for the lazy. Mulch is a natural or man made covering for bare soil. Usually to qualify as a mulch the material used should retain moisture and heat. You either cover it, use it or lose it. Bare soil is a gardeners worst nightmare, it can & will quickly be colonised by weeds which provide a safe haven for diseases, pests & other garden nasties. If you don't mulch or use some other form of weed suppressant you'll spend all season picking them out. In addition to being an eyesore, weeds will also compete with your plants for nutrients, sunlight & space. A good mulch will enrich the soil below with nutrients and prevent the growth of new weeds. Many mulching materials also look good and are used for decorative purposes. >> Mulching in a Raspberry Patch. Every garden can benefit from a good mulch. If the correct (biodegradable) materials are used the mulch will slowly decompose in the soil enriching it with nutrients. NUTRIENTS = HAPPY & HEALTHY PLANTS.. Excess moisture is retained and slowly released to the soil below = less watering & work for you. Can be applied in small or large areas for long term control & prevention of garden weeds. Cheap, easy & natural solution for providing your plants and soil with beneficial nutrients. 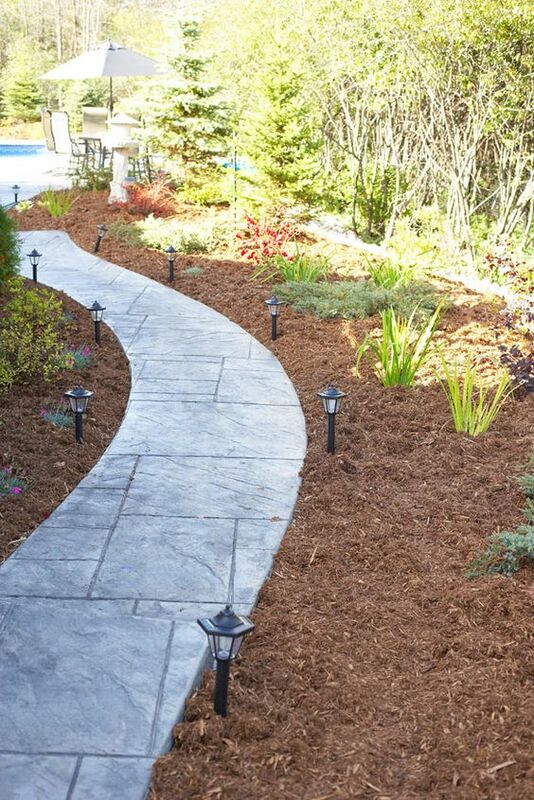 Decorative mulches such as bark, wood chippings, glass & stones can improve the look of your garden. Insulates the soil & plant roots to protect against extreme temperatures during summer & winter. Inhibits the growth of certain plant diseases. If laid correctly there is very little that can go wrong. Fine mulches layered thickly can quickly become matted and prevent moisture from reaching the soil. Be sure to use a reputable supplier that guarantees your mulch is weed, disease and pest free. In wet soils a deep mulch can lead to excess moisture in the root zone, causing root rot. Wood chippings can contain honey fungus. Once you have applied your mulch water the area more thoroughly to reach the roots of nearby plants. Leave adequate breathing room. Don't pile too much mulch around plant stems or tree trunks. Mulch materials fall into two categories: biodegradable and non-biodegradable. Will slowly decompose over time. You should replenish it or "top-up" as required. Remember, an effective mulch should be at least 3" deep. Readily available and cheap they should be your first choice. A useful base layer for other mulch materials. Cardboard or old newspaper can be laid a few sheets deep then covered with any of the other biodegradable materials below. Wet the cardboard or paper before putting it down if it's windy, this will stop it from blowing away. Ideal for the top layer of mulch if using cardboard or newspaper underneath. Be warned small weeds may take root on the top layer but can easily be pulled out. ​Ensure you buy the compost or manure from a reputable supplier otherwise it may be infested with weed seeds, diseases or other garden pests. Farmyard manure is particularity vulnerable as it's often left out in the open. Scrape off the top layer and apply a little to test for weeds before applying the rest. Long lasting, if applied correctly it can last a whole season. Often used in vegetable gardens it will stop soil born diseases from splashing up onto your plant leaves. Straw will also provide a nice home for numerous beneficial insects such as spiders, who will move in and help to keep the pest population under control. Easily removed with a rake once finished. Ensure you buy from a reputable supplier as straw or hay can be infested with weeds, pests & diseases or contain chemicals such as herbicides & pesticides. Not to be confused with bark. Fine chippings are ideal for retaining moisture and break down much quicker than bark. The chippings should be around 1-2 inches in diameter, anything smaller will retain to much moisture and cause problems for your soil and plants. If you have a sawmill or similar nearby, call up and ask if they have any. If you find one and can collect you'll save a fortune when compared to buying from a garden centre. Bark won't decompose easily and can become a hassle to move or dig up when introducing new plants. Bark comes in a variety of styles, shapes and colours. We recommend it's use on driveways, paths & around border, trees or plants where you don't intend to dig. Be on the look out for honey fungus & always buy your bark from a reputable supplier that is certified weed & pest free. Be warned grass clippings will quickly decompose producing a nasty, unpleasant odour. They can quickly become matted and prevent moisture from reaching the soil. An effective weed suppressant best suited to unplanted areas. Clippings are best left on the lawn to fertilize the grass or composted then used as mulch. Do not use grass clippings as a mulch or compost if you have applied any sort of chemical weed killer or fertilizer recently, just bin them or leave them on your lawn. A carpet in the garden! Are you mad? Please don't go out an buy a new carpet. If you can get your hands on an old, non-synthetic carpet you will have yourself the only mulching material you'll need. It will eventually breakdown in the soil, retain moisture and block weeds from growing. It's easily laid and easily taken up. Your local junk yard or recycling plant may have one. Cover the carpet with a thin layer of compost or wood chippings for a more natural garden look. Turn your barren garden into productive paradise by layering biodegradable mulch materials to create a weed free, nutrient rich soil below. A weed barrier like cardboard or carpet is laid down to smother weeds. Layer compost on top of the weed barrier. Add wood chips or straw as a final layer of mulch. As the materials decompose worms will move in, softening the soil, creating an aerated & healthy plant bed. Sheet mulching can range from a couple of inches to a couple feet thick depending on how much new soil is required and how bad the old stuff was. For the first 2 seasons the richness of the soil can sometimes be too strong for sensitive plants or seedlings. Non-biodegradeable mulches such as plastic sheeting should be removed from the area once your finished with them. They won't degrade in the soil and if left for prolonged periods can leech toxic chemicals into your soil. Will last a long time and has many of the same benefits of natural carpet. The only downside is that it won't decompose, remove it once finished. Often used for warm weather fruits and vegetables such as tomatoes and peppers. Layer a sheet of black polythene over the soil to retain heat and increase growth. Cool weather plants will suffer under this method due to excess heat being trapped in the soil. Can be useful for prolonging the growing season in cold climates. Often used as a base layer to prevent weed growth under paths, driveways and ornamental gardens. It will take a long time to breakdown in the soil and if laid correctly will prevent weeds for several years. Pin down the fabric with landscaping pegs every 1ft. You'll need a few of these to keep the seams closed. Overlap edges by 1ft to prevent weeds from breaking through. Rough side goes down to help grip the soil. Are decorative "mulches" that are best used as a top layer on driveways, paths or borders. On their own they won't prevent weeds nor will they enrich your soil, often used in the top of pots or across small areas. Mulch can be applied anywhere there is bare soil. Mulch around borders, trees & shrubs to improve the soil health and prevent weeds from growing. If mulching for the first time it doesn't matter when you first apply it, the sooner the better. Biodegradable mulches will have to be replenished as they decompose. Usually in spring & autumn. A successful mulch should be at least 3" thick and no more than 5" unless your creating soil. Don't pile it against trees or stems, pull it back a few inches so they are exposed. Lay the newspaper or cardboard 1-2" deep. Add 1-2" of high quality compost. Leave a few inches around the base of trees and the stems of established plants or shrubs. Wood chippings are optional. Use extra cardboard or paper if you cannot source them. Remember to water more thoroughly. As the mulch decomposes replenish it. Usually done in the spring & again in the autumn.